A combination of recipes from bassjunkiesfishingaddiction.blogspot.ca and www.foodnetwork.com. Makes 24 cupcake sized mini-cheesecakes. I often halve the recipe. Make the bacon: Preheat the oven to 350 degrees F. Put the bacon pieces in a large skillet and cook over medium heat, stirring occasionally, until almost completely browned, about 4 minutes. Pour off the drippings and reserve. Sprinkle 2 tablespoons brown sugar over the bacon and cook, stirring, until the bacon is crisp and glazed, about 3 more minutes. 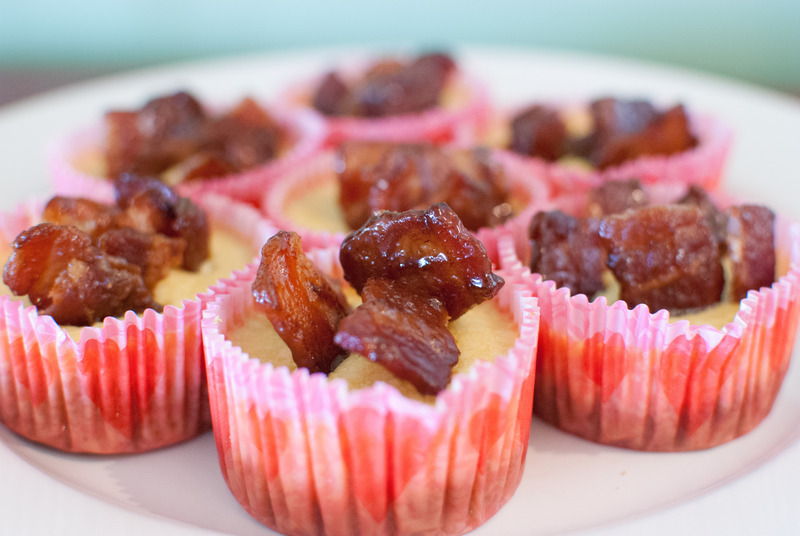 Transfer the candied bacon to a plate; set aside until ready to use. Make the crust: Line 24 cup muffin pan with paper liners. Pulse the graham crackers, butter, sugar, 2 tablespoon bacon drippings, and the salt in a food processor until finely ground. (*Next time I am going to consider using only bacon grease, no butter.) Firmly press 1 tablespoon of the crumb mixture into each muffin liner. Bake until the crust is set, about 12 minutes. (Note – do not need to do this – it made the crust a little too crunchy last time. Some recipes do not have you prebake the crust.) Let cool in the pan on a rack. Make the cheesecakes: Reduce the oven temperature to 325 degrees F.
With a hand blender or a stand mixer, blend your room temp cream cheese with 1/2 c. of the maple syrup (I sometime add more). Add in the cream and the vanilla continue to blend. Add the eggs one at a time and make sure they are all fully blended prior to adding the next one. Once all are blended you can pour the mixture onto the crust. 1/4 c per cupcake. This entry was posted on February 17, 2013 by mdaucello in Parties We Have Held, Recipes.